Back in 1984, five snowmobilers from the Waterford area decided on a whim, to write bylaws, petition for a charter from the MSA and become a snowmobile club. Because they rode from area to area in the U.P. and elsewhere they coined the term snofari style riding. And because they were constantly on the move, they adopted the name Snomads. The rest as they say is history. This new snowmobile club was as much about camaraderie amongst the fellas as it was about riding snowmobiles. The guys had membership cards printed with membership numbers 1 through 5 on them. Now these five guys were all men’s men. One being the infamous Jim Duke and Jim happened to be married to a lady known as a sweetheart but not fond of B.S. Being an avid snowmobiler herself, Connie Duke figured she would naturally be member number 6. Now the fellas weren’t all that fond of the idea at first, but beings as she was Connie and there were only 5 of them, they had no choice but give in and assign her membership card number 6. This was a position within the snowmobile community that she was extremely proud of her entire life. 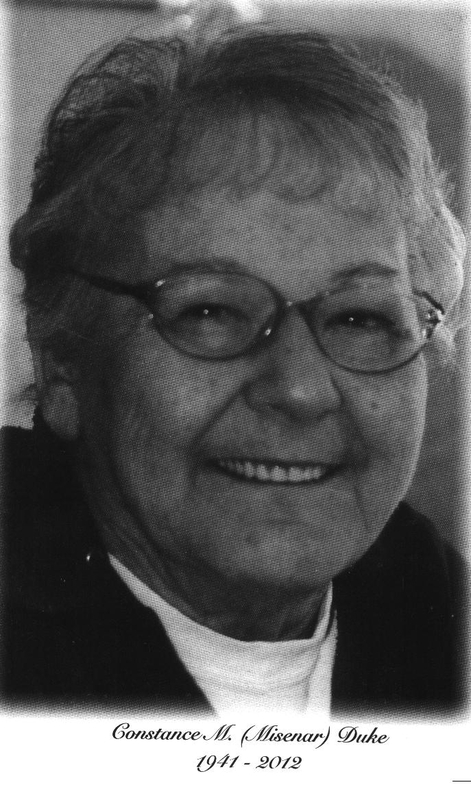 Even though she and Jim moved to the U.P., she stayed very active with the MSA, Connie always considered herself a Snomad first and foremost. During the next 20 years or so, the Snomads Board of Directors bestowed honorary memberships upon several prominent members based on their contributions to the Club. However in 2006, as President, I proposed that we correct a long overdue objective. So at the MSA convention in Grand Rapids that year, V.P. Bill Chatfield and I attended the festivities. One of the highlights of my life was seeing Connie’s face as we surprised her at the banquet on Saturday night, and presented her with her Snomads Honorary Lifetime membership in front of her friends and peers. Her sweet little face beamed with pride and joy and I will never forget that look. This past summer, after a long history of health issues, Connie went to be with the Lord. She leaves behind an amazing list of friends and family members and will be sorely missed by all who knew her. As I paid my respects at the funeral home, I noticed a small box for mourners to place mementos inside of to be buried with her. Sitting home that evening, I decided to honor her one last time. I pulled up her membership card and where it listed her status as Honorary Lifetime, I changed it to Forever, because her accomplishments transcend a lifetime. The next day at the funeral, I placed it in the box for her to take with her, because she will always be the First Lady of the SnomadS Snofari Club. We love and miss her dearly.